Voice is one of mobile manufacturing company of Pakistan. Now it is introducing phenomenal Smartphone’s for its valued customers. 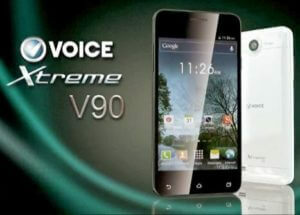 This company introduces Voice Mobile Xtreme V90 with an astonishing feature. This is complete feature Smartphone and cellular operators easily avail all facilities of Smartphone by using it. It also provides Android system Jellybean in this launched cellular phone and it also giving an excellent processor system 1.4 GHz in this hand-set. It also provides dual sim option of its buyers and customers also get WiFi and Bluetooth option in this voice mobile. This is company of Pakistan and Now days it is launching exceptional Smartphone’s for all the Pakistanis. It is providing 16GB built-in memory in this launched hand-set and 3G technology services is also available in it. As we all know in Pakistan 3G internet facilities has already launched and Voice has launched 3G enabled Smartphone for its valued consumers of Pakistan. This mobile also gives an excellent rear camera service now buyers of this hand-set can enjoy 13 mega pixels rear camera facility by using it and this is also provided face & smile detection option in camera feature. It also gives front camera option and now buyers can also use it for video calling and taking selfies. It also gives option GPRS and Wi-Fi for using internet service of its buyers. The further details of this Smartphone are given as below. System: Android OS, Jelly Bean 4.2. Processor: Quad-Core Turbo 1.4 GHz. Rear Camera: 13 Mega Pixels (LED flash). Front Camera: 2 Mega Pixels (face detection). Display Screen Size: 4.7 Inches. Display Pixels: 1280 x 720 pixels. Bluetooth, WLAN, WiFi, GPRS, USB. Other Features: Stereo FM Radio, Micro SD card supports 32GB, Multi-touch, and 16M colors. Latest Features: Light sensor, Document viewer, IPS Crystal Screen, MP4, Speakerphone.